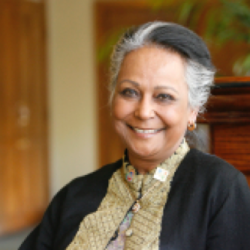 The World Business Academy would like to congratulate Solvang resident, Deepa Willingham as the recipient of the 2018 United Nations Association (UNA) Peace Prize. We humbly thank Deepa for her important humanitarian work in Santa Barbara County and around the globe. The UNA of Santa Barbara is in its second year of honoring local residents who have “achieved demonstrable and measurable progress in creating peace in the world, advanced the cause of human rights internationally, and/or advanced the progress of developing nations.” Rinaldo Brutoco, Founding President of World Business Academy, was the organization’s first Peace Prize winner in 2017. Mrs. Willingham’s professional life led her to roles in health-care management, education, and entrepreneurship. She is an active supporter of the non-profit community and has served on the boards of Corner Stone House of Santa Barbara, Santa Barbara Rehab Institute, Santa Barbara Swim Club, and Santa Ynez Valley Cottage Hospital. Deepa is the founder and chair of PACE Universal, a non-profit committed to ending trafficking and uplifting communities through the education of girls and women living in extreme poverty. She opened her first environmentally sustainable school for more than 200 girls ranging from nursery to 12th grade at the Piyali Learning Center, a community 40 miles from native Kolkata. “Educating girls is a very successful anti-child-trafficking program that young people will carry on. I don’t think our government is paying enough attention to this. You don’t need to send bombs. You need education. There’s a reason organizations like the Taliban are deathly afraid of educated girls,” Willingham said in 2014. UNA of Santa Barbara is hosting their Peace Prize Awards dinner on September 21st, from 6pm-9pm at the Goleta Hilton Garden Inn. Tickets may be purchased by clicking the button below, or by phone at (805) 680-9445. The UNA of Santa Barbara was founded in 1947 and is the oldest chapter in the nation. They engage locally on many important global topics including at-risk youth, education, climate change, human trafficking, and the international refugee crisis. For more information, please visit their website at unasb.org.